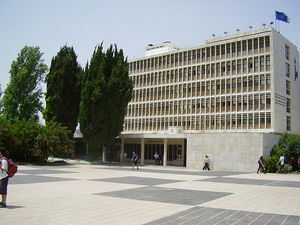 The Hebrew University of Jerusalem is located in Jerusalem, Israel, and is one of the oldest universities in Israel, founded in 1918 and officially opened in 1925. The Hebrew University of Jerusalem is Israel's leading research institution and officially ranked as one of the 100 top universities in the world. The Hebrew University of Jerusalem further produces a third of Israel's civilian research and is ranked 12th worldwide in biotechnology patent filing and commercial development. The Hebrew University of Jerusalem boasts 6 campuses, 7 faculties, 14 schools, 23,000 students, 1,000 senior faculty members, 1 Fields Medal in Mathematics winner, and 8 Nobel Prize winners. Among its founders include Albert Einstein, Martin Buber, Chaim Nahman Bialik, and Chaim Weizmann. Elon Lindenstrauss of the Hebrew University of Jerusalem received the Fields Medal in Mathematics in 2010, an award that is regarded as the equivalent of a Nobel Prize. Lindenstrauss was the worlds first Israeli to ever receive this prestigious award, and he received it for his "for his achievements in the area of measure rigidity in ergodic theory and their applications to number theory." Eight members of the Hebrew University of Jerusalem have received a Nobel Prize. Albert Einstein, one of the most prestigious and well-known scientists to ever live, was the first member of the Hebrew University of Jerusalem to ever receive a Nobel Prize. Einstein received his Nobel Prize in 1921 "for his contribution to theoretical physics, and especially for his discovery of the law of the photoelectric effect." Roger D. Kornberg of the Hebrew University of Jerusalem won the Nobel Prize in Chemistry in 2006 "for his studies of the molecular basis of eukaryotic transcription." Kornberg has helped in pioneering the research of the structural biology of macromolecules and our understanding of the basic processes of life. Aaron Ciechanover of the Hebrew University of Jerusalem received the Nobel Prize in Chemistry in 2004 "for the discovery of ubiquitin-mediated protein degradation." He received the prize along with Prof. Avram Hershko, and his American Colleague Prof. Irwin Rose. Ciechanover has made significant contributions to understanding of the mechanisms of intracellular processes. Daniel Kahneman of the Hebrew University of Jerusalem received the Nobel Prize in Economics in 2002 "for having integrated insights from psychological research into economic science, especially concerning human judgment and decision-making under uncertainty." Ada E. Yonath of the Hebrew University of Jerusalem received the Nobel Prize in Chemistry in 2009 "for having described the structure of the ribosome, the body which produces protein in the cell." Avram Hershko of the Hebrew University of Jerusalem received the Nobel Prize in Chemistry in 2004, alongside Aaron Ciechanover, "for the discovery of ubiquitin-mediated protein degradation." Alongside tboth Ciechanover and Hershko, Irwin Rose was also one of the three collaborators who also received the Nobel Prize in Chemistry in 2004 with them. David J. Gross of the Hebrew University of Jerusalem won the Nobel Prize in Chemistry in 2004 "for the discovery of asymptotic freedom in the theory of the strong interaction, the force operating between quarks." Robert J. Aumann of the Hebrew University of Jerusalem won the Nobel prize in Economics in 2005 "for having enhanced the understanding of conflict and cooperation through game-theory analysis." 13 members of the Hebrew University of Jerusalem have won the WOLF Prize, 33 members of the Hebrew University of Jerusalem have won the EMET Prize, 90 members of the Hebrew University of Jerusalem have won the Rothschild Prize, and more than 250 members of the Hebrew University of Jerusalem have won the Israel Prize. This page was last modified on 10 June 2017, at 20:31.